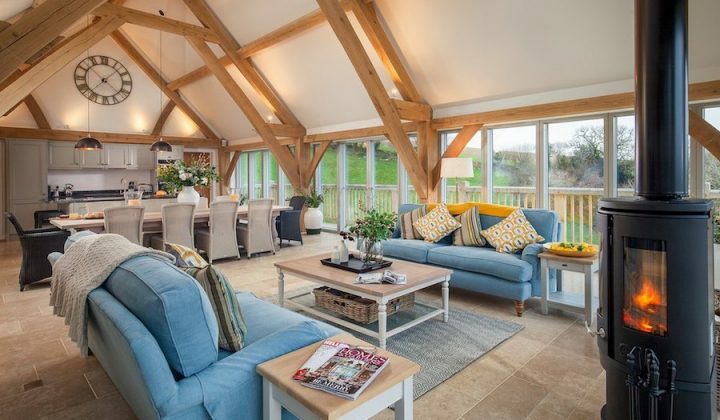 Cornwall meets the Caribbean on this unspoilt archipelago just 28 miles from Land's End. 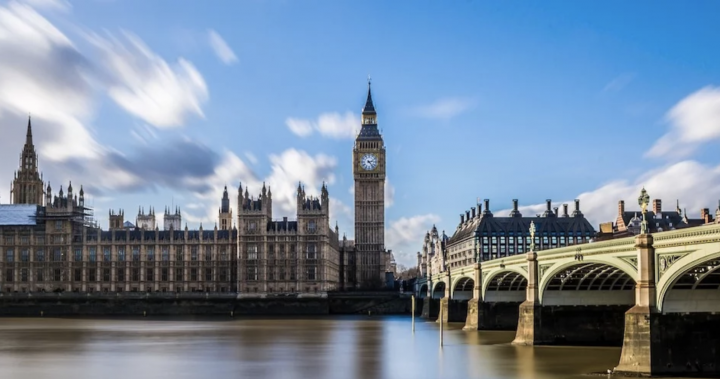 Here are my top tips for visiting with the family in 2019. As I write this, my 3-year-old is watching toy reviews on YouTube. The older one’s playing Tetris on my phone. I know, I know, they should be playing with sticks in the garden but a girl’s gotta work! In truth, both our kids spend too much time plugged in. But for four full days last year they didn’t even ask. 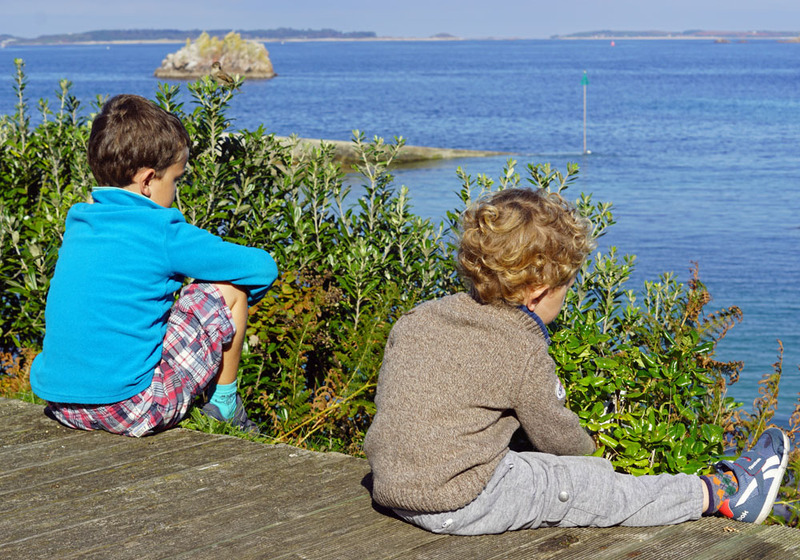 The Isles of Scilly’s stimulating landscapes and super safe environment make it a natural playground for children and an amazing place to reconnect as a family. 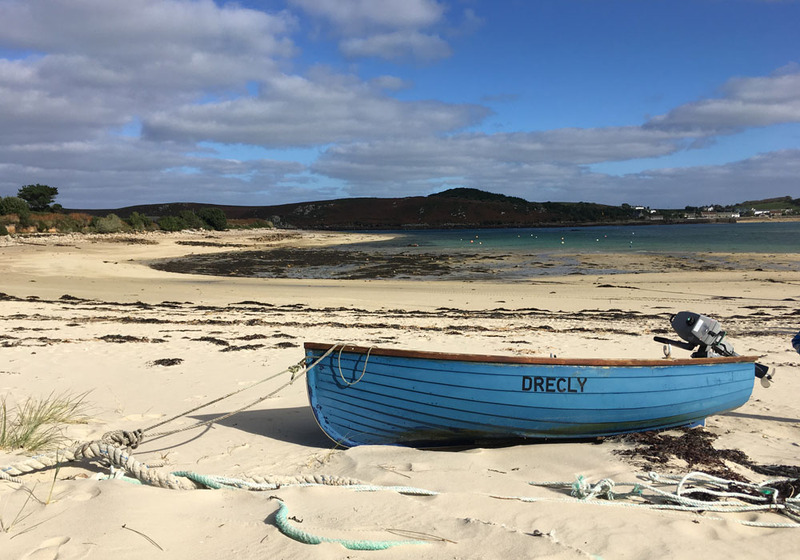 Perfect for kids, foodies, walkers, wildlife enthusiasts and anyone seeking a little peace, Scilly offers up deserted beaches, fresh seafood and the screen-free, simple life. We went in October, just before many businesses shut up shop for winter and found the islands quiet but still warm enough for days spent outdoors (and the occasional dip in the sea). 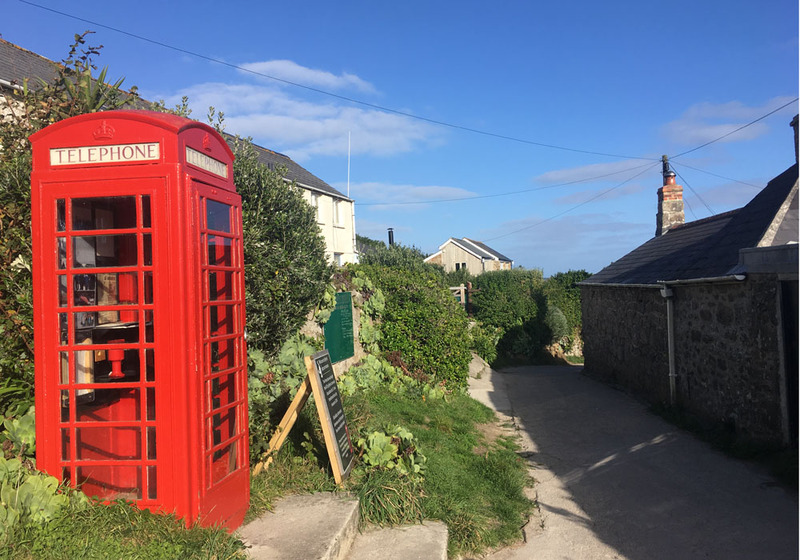 Each island has a slightly different character and it feels different from Cornwall too – more unspoilt… an even slower pace of life. 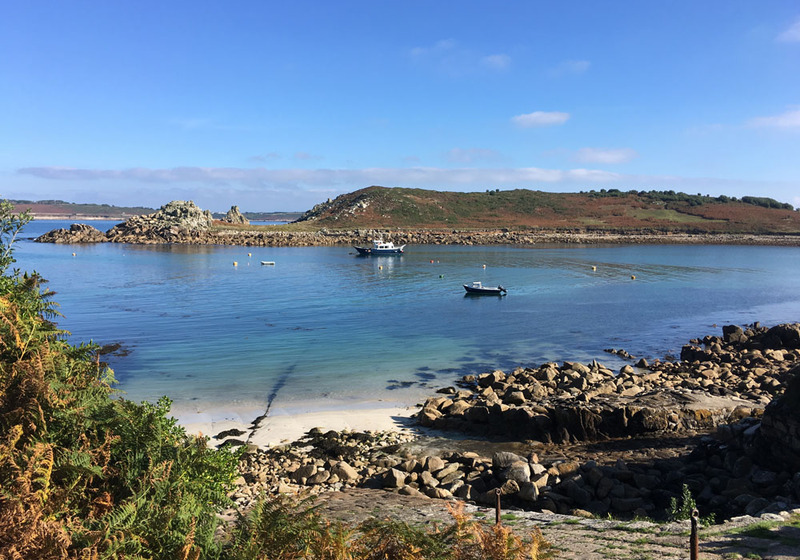 If you’re seeking inspiration for your own Scilly adventure, here’s what we got up to and some practical tips to help you plan your trip. 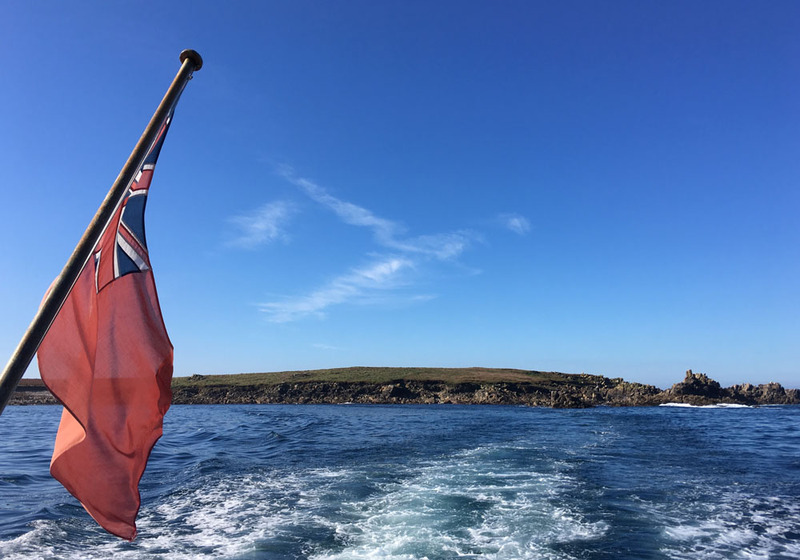 We travelled to St Mary’s, the largest of the Isles of Scilly on the Scillonian ferry from Penzance. You can get there more quickly by plane but if time’s not an issue, take the scenic route. We were warned about seasickness but had a calm crossing and were entertained by regular dolphin sightings, a minke whale and numerous diving birds. It quickly became apparent from the sea of binoculars that we’d be sharing our visit with an army of avid birdwatchers (one couple had come from as far as Wisconsin). 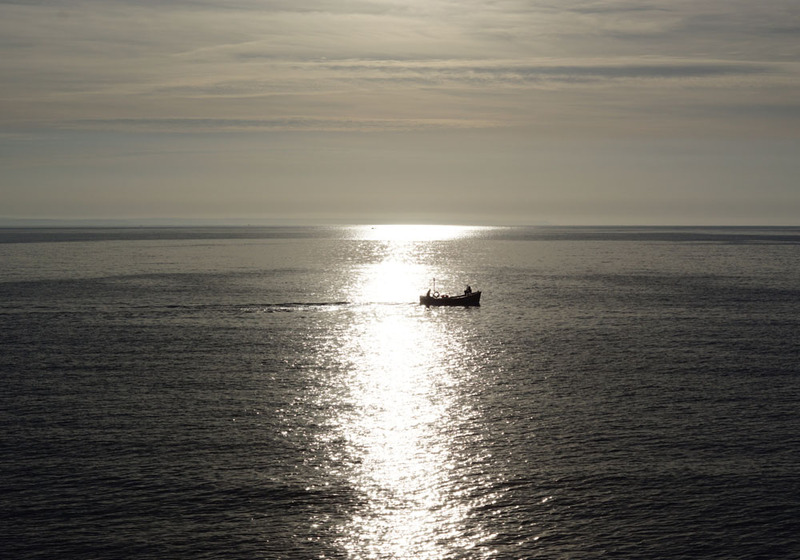 Scilly, we discovered, is on the migratory route of many rare birds and autumn is prime time to spot them. That said, it’s too late for Scilly’s famous puffins – so make sure you check your timings if you have your heart set on seeing them. Our bags were transported directly to our accommodation, so we were able to spend the afternoon exploring. 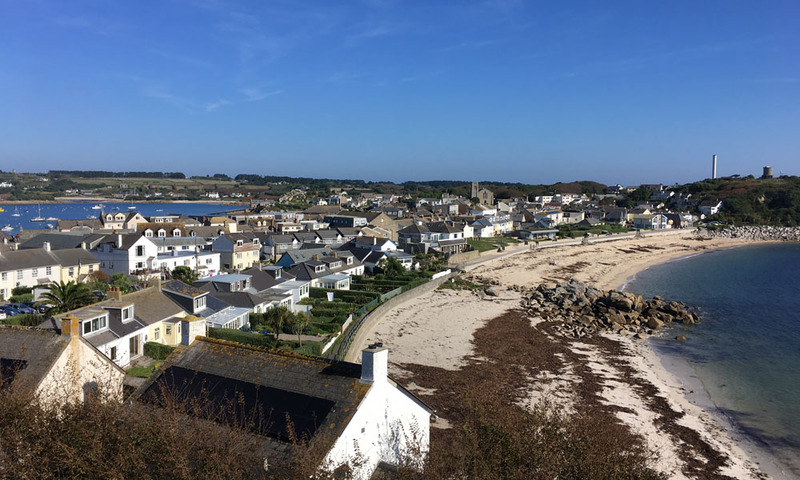 We began at Porthcressa Bay, then did the 45-minute walk around the garrison. This is a brilliant way to get your bearings. 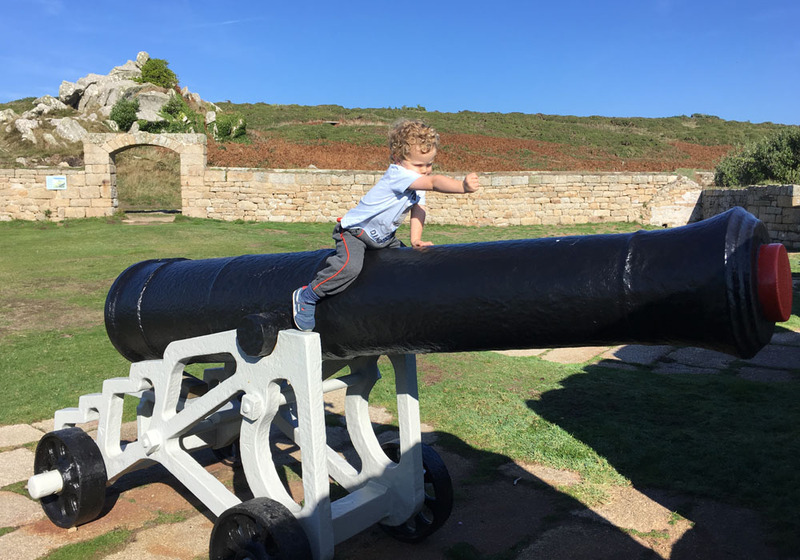 As you round each corner, past the many cannons that kept the kids going, you look out towards ‘the off-islands’, St Agnes, Bryher, Samson, Tresco and St Martin’s. 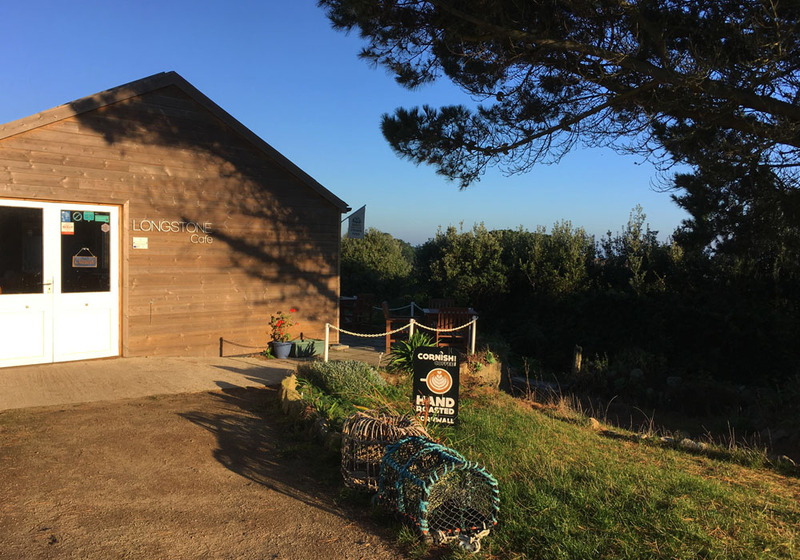 We stayed at Longstone Lodge, a hostel in walking distance from Hugh Town and ate in on our first night, with posh takeaway meals pre-ordered from Tanglewood Kitchen. 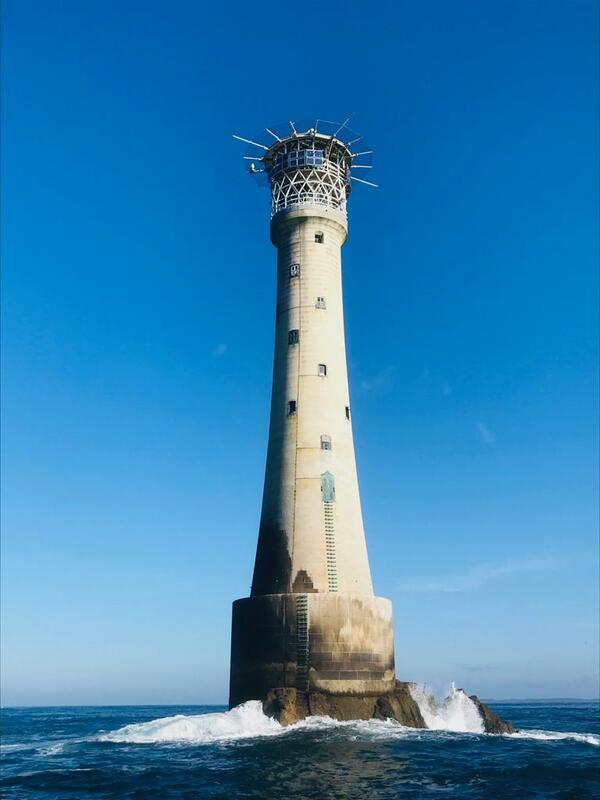 On our second day, we lucked out with good weather for a trip to Bishop Rock lighthouse. 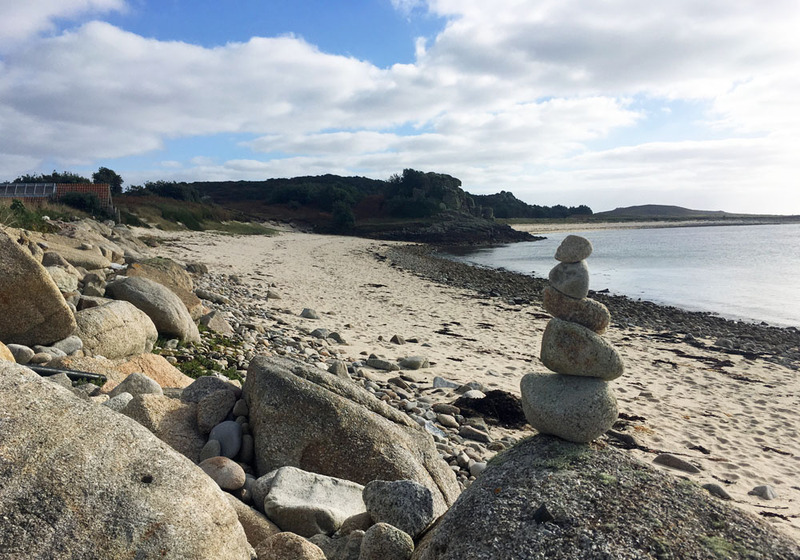 The westernmost point of the Isles of Scilly, Bishop Rock is the smallest piece of land with a structure on it, regularly pulverised by the Atlantic – next stop America! It’s mind boggling to think of the people who built it in this remote place in 1858. We circled the lighthouse, listening to tales of the numerous ships that have gone down in these waters, as gannets dived all around us. The second part of the day trip took us to the ruggedly beautiful island of St Agnes. St Agnes joins to neighbouring Gugh by a sandbar, which we swam off, accompanied by a playful seal that kept popping up to one side then the other. 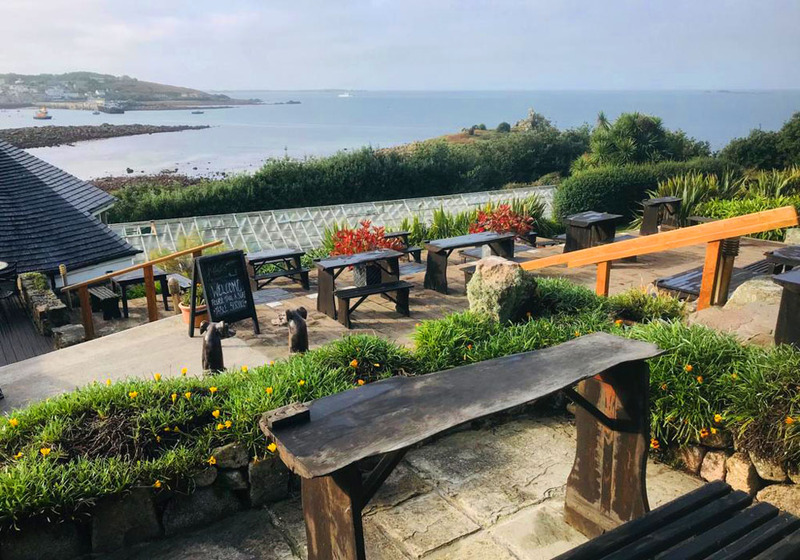 For eats, St Agnes has a characterful pub, The Turks Head, which has an insanely good beer-garden view. 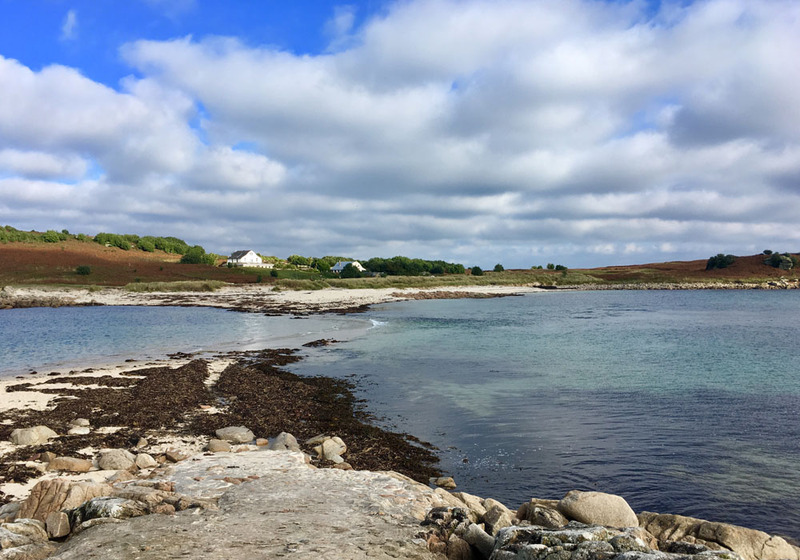 Plus there’s a dairy farm/campsite, Troytown Farm that’s become famous for its ice cream and countless coves to discover on foot. 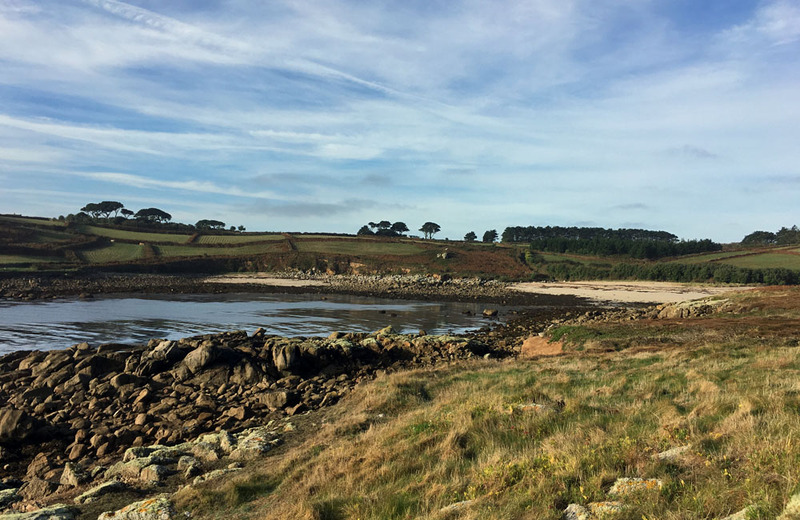 From the famous Hell Bay Hotel to Michael Morpurgo’s novel, Why The Whales Came, we’d heard more about Bryher than any of the other islands. It was the quietest of the islands we visited and my favourite, if you force me to choose. 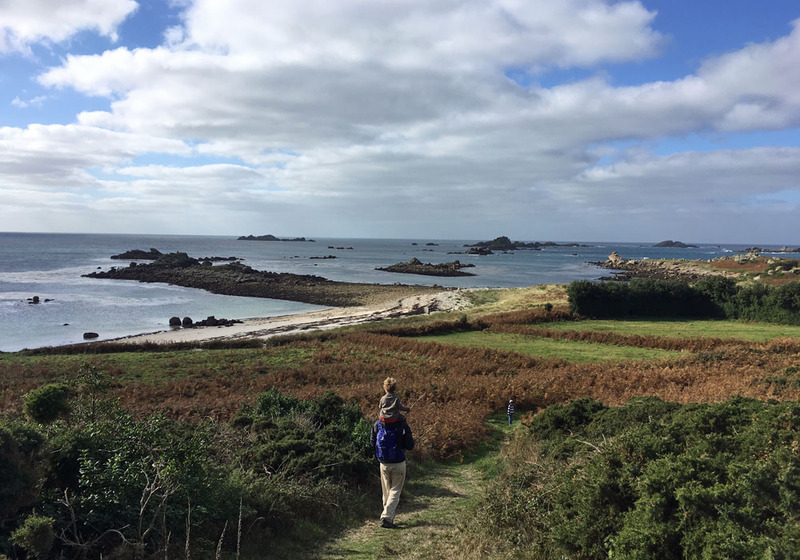 On Bryher, we did little but walk and gawp at the views. We managed a full lap of the island without a word of complaint, even from our three-year-old. Round every corner was another jaw-dropping stretch of sand they couldn’t help but run towards. 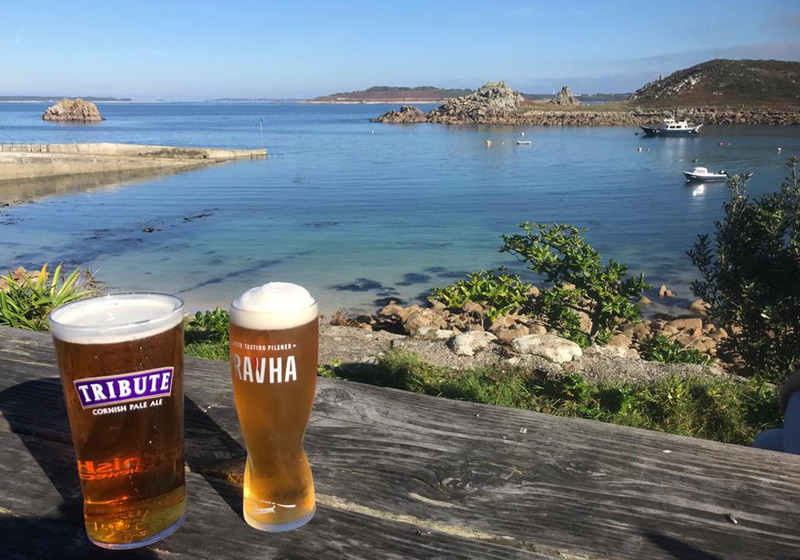 We had a picnic at Rushy Bay, looking out towards Samson, then grabbed a beer at Fraggle Rock Café – the sort of front-room bar, you only find in places like this and totally perfect for the mood of the day. Tresco is the most manicured of all the islands and for that reason, I wondered if I would like it as much. 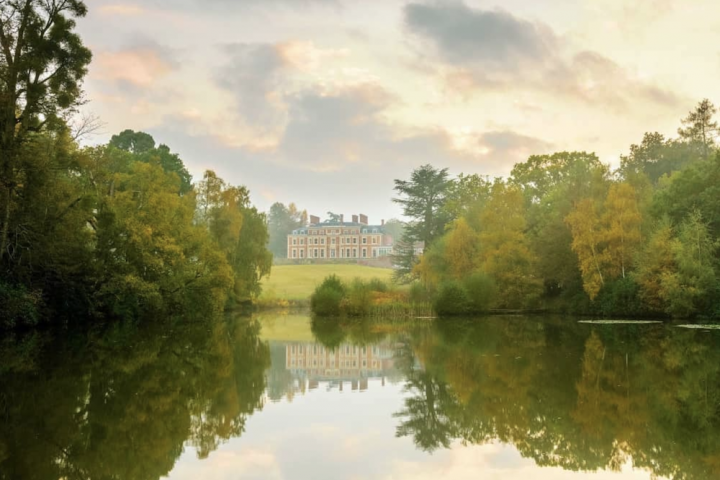 But of course it is utterly gorgeous, which is why it is so popular with visitors. It has all the wild Scilly beauty but with an easily accessible flat white if the daily craving strikes. 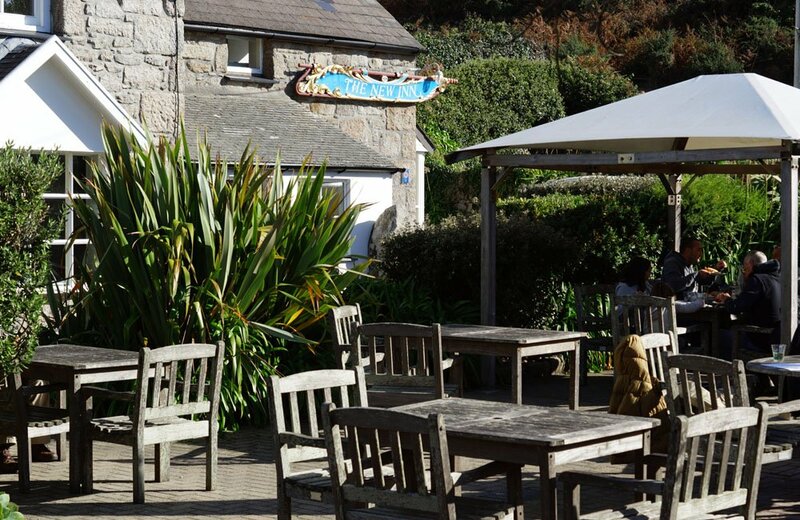 And at a time of year where many businesses are shut elsewhere, Tresco is welcome for its foodie possibilities. 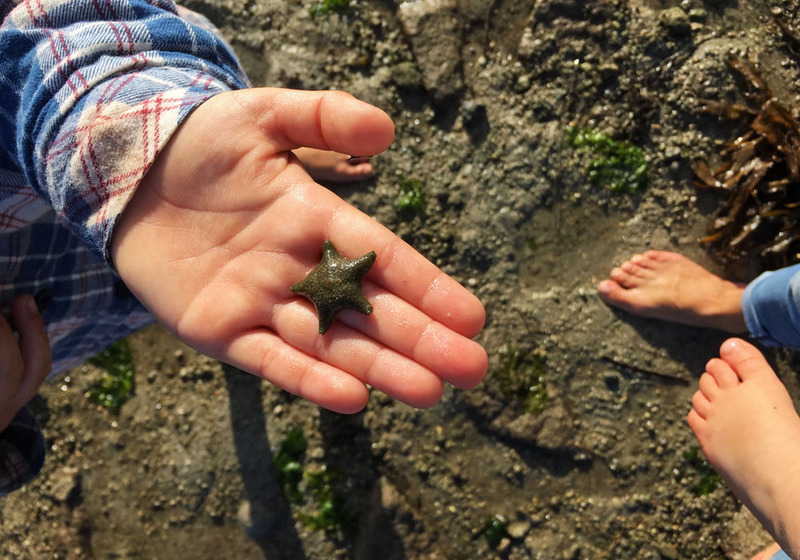 We started the day with coffees at Ruin Beach Café and rock pooling with Scilly Wildlife Trust. They host regular guided sessions during the season. The best meal of our stay was at The New Inn, where we stopped for lunch on Tresco. 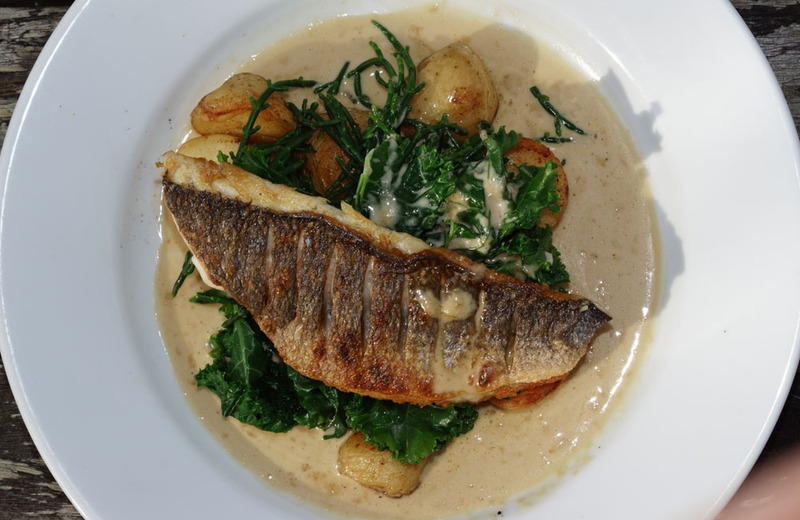 The two AA rosette pub offers a menu of fresh seafood and local meat and also has ensuite rooms. 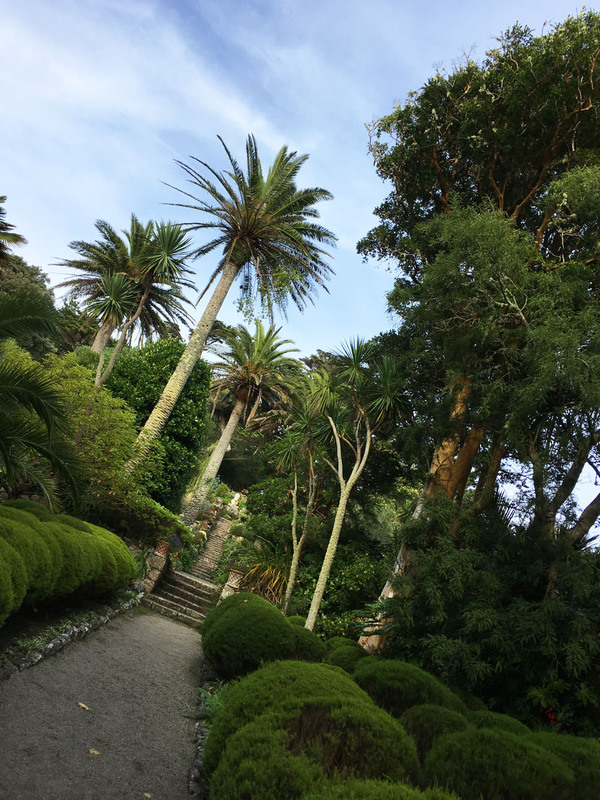 And we couldn’t go to Tresco without a visit to the renowned Abbey Garden. 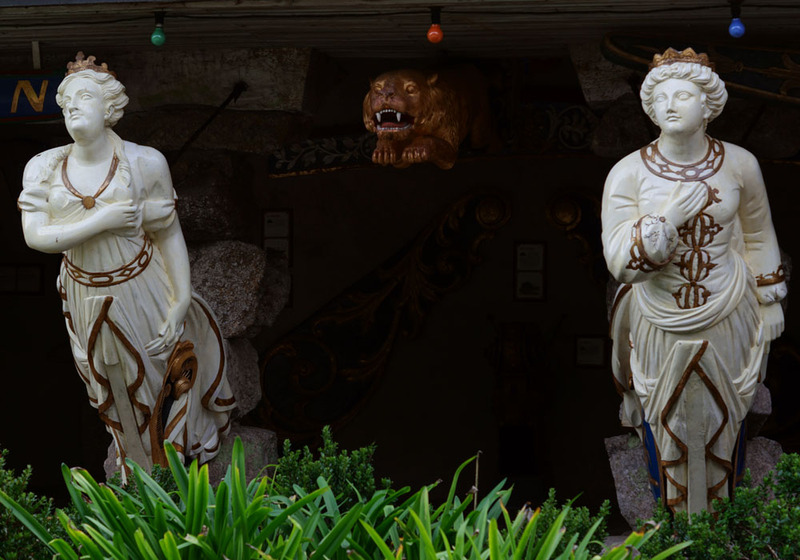 Home to thousands of exotic plants from around the world (and a tribe of rare red squirrels), the gardens were built in the 19th century around the ruins of a Benedictine Abbey. 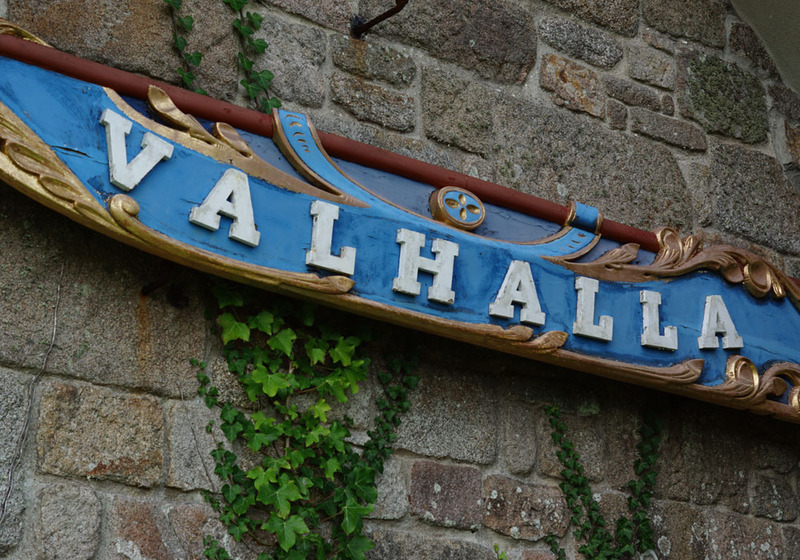 Here you’ll also find Valhalla, a unique museum of ships’ busts from wrecks found around the islands. We took an afternoon ferry home, so had most of our last day free to wheel around St Mary’s. We hired bikes from St Mary’s Bike Hire the previous evening and loved finding some really quiet spots. Pelistry Bay in the early morning offered up deserted white sand, strewn with shells and sea glass. 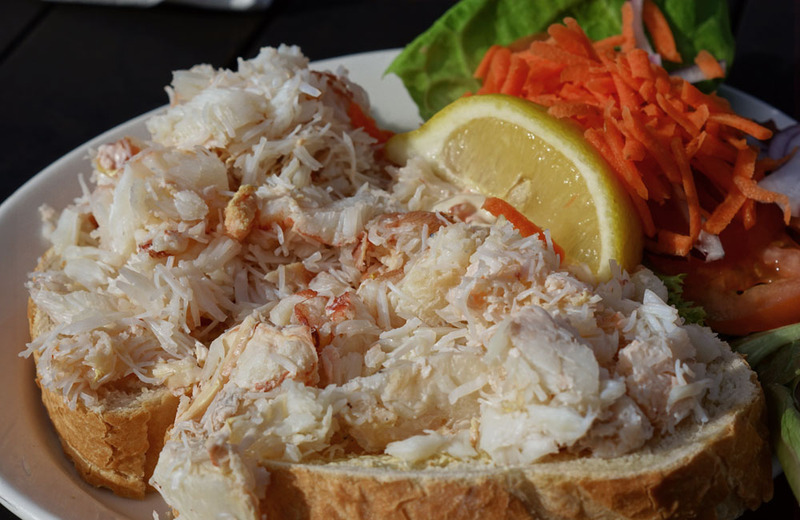 We were also able to squeeze in one final lunch – mountains of beautiful, fresh crab and Troytown Farm ice cream – at Juliet’s Garden. 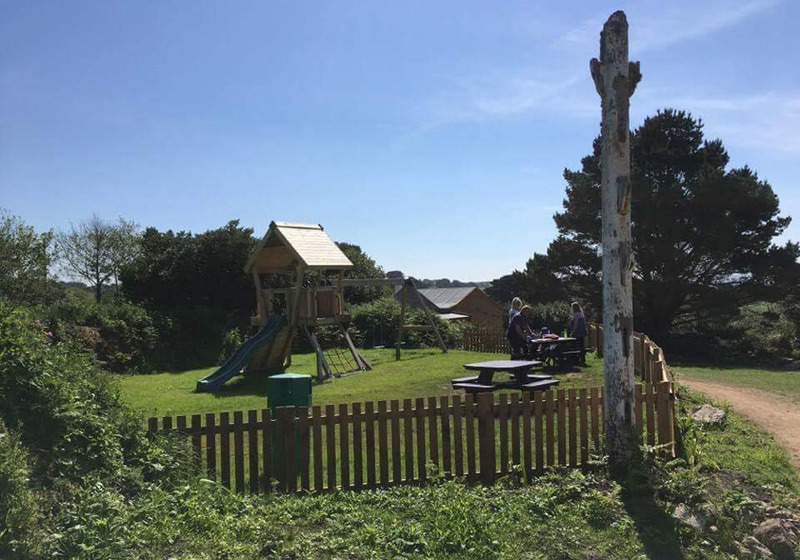 The café has a pretty terraced garden, with views across the water to Hugh Town and is perfect for a family lunch, thanks to the large grassy lawn and kid-friendly menu. 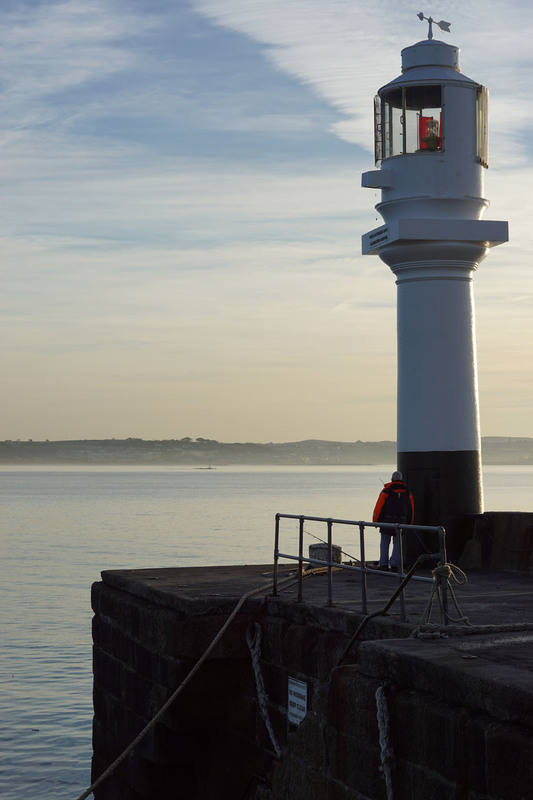 We totally lost track of time – easily done here – and watched the ferry pull in from our table. And I would have happily watched it leave again. This was truly one of the best family holidays we’ve had; with some great food, restful days and Swallows & Amazons-style magic we won’t soon forget. You can’t take your car to the islands, so however you travel it’s as a foot passenger. 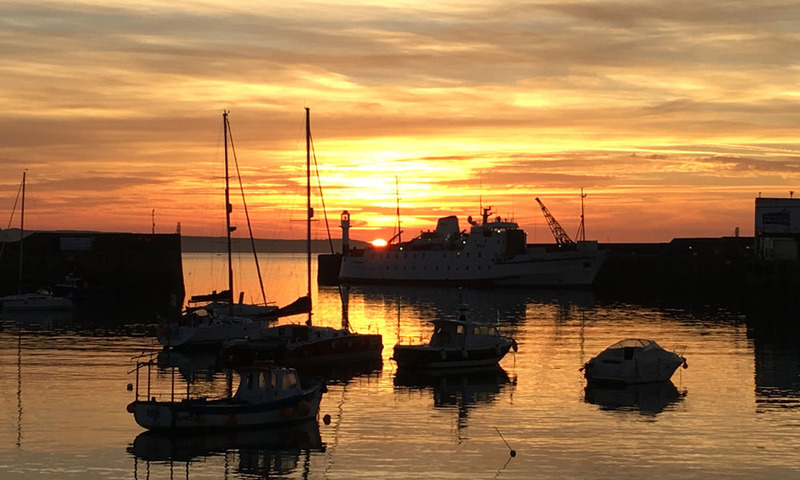 We caught the Scillonian Ferry from Penzance (from £300 for a family of 4) early on Saturday morning and arrived in time for a full afternoon on St Mary’s. We dropped our luggage in a container on the quay and left our car in the park-and-ride car park behind Sainsbury’s that serves the ferry (£30 for 4 days) and has a shuttle service back to the quay. Your luggage goes into a container and for a small fee (£1.50 per bag) it can be transported directly to your accommodation on St Mary’s. Simply write where you’re staying on your luggage label and Island Carriers will leave an invoice when they deliver your bags. You can also arrange to have your luggage delivered back to the ship for your return journey. Some accommodation providers offer a luggage transportation service too, so check that when you book. For anyone camping, you can take two pieces of luggage per person, which you will probably need but it can all simply meet you at the campsite. 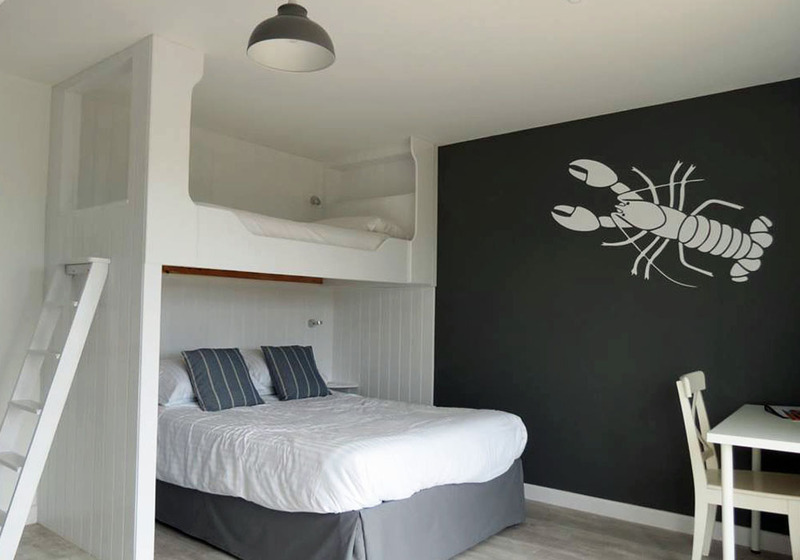 We stayed in one of the family rooms at St Mary’s only hostel, Longstone Lodge (£120 per night), which opened in May 2018. 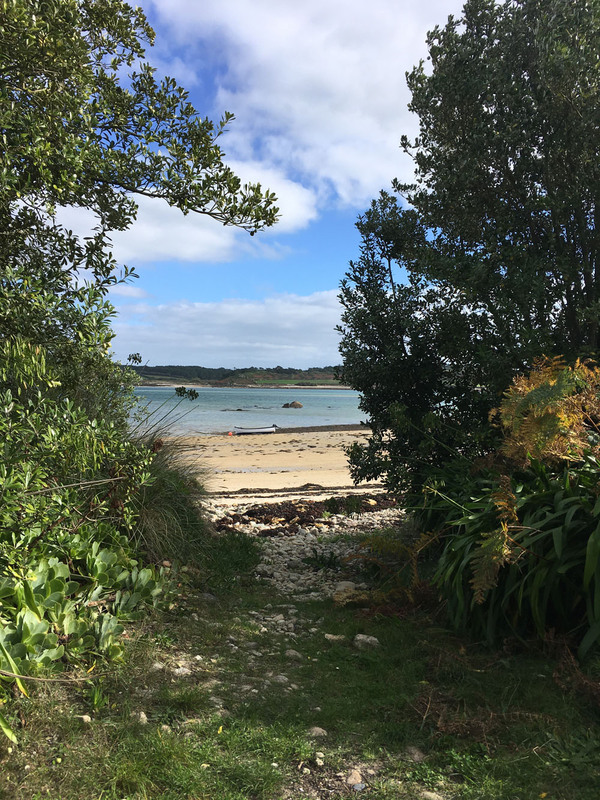 It’s anywhere from a 15-25 minute walk in-land from Hugh Town, depending on the kids’ energy levels. You can also grab a taxi for £2 per head. Our double bunkroom was comfortable and relaxed, with a shared bathroom that nobody else seemed to be using throughout our stay. In the large, well-equipped kitchen, we mingled with a sociable crowd of bird-watchers, walkers, a shanty group and one other family. 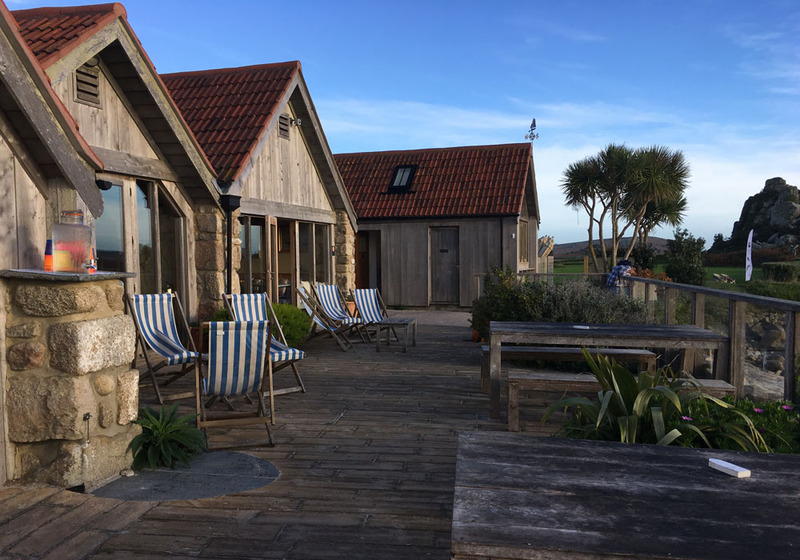 Longstore Lodge also has a café, with lobster nights in season and a stash of wine, local ale and cider and homemade ready meals, for days when you roll in exhausted from a day of fresh Scilly air. As previously mentioned, you can’t bring your car on the ferry, so there are various ways to get around. We mostly walked. The kids moaned at first but were well used to it a couple of days in, lured by island fudge and endless games of I Spy. There are daily boats to the other islands from the quay where the ferry comes in. 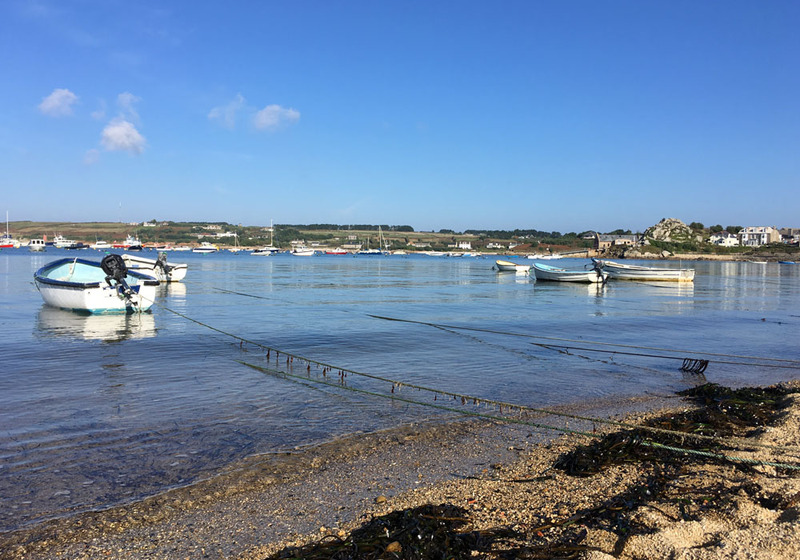 The times vary depending on tides, but can be checked on the St Mary’s Boatsmen’s Association Facebook page or blackboards in town and at the quay. 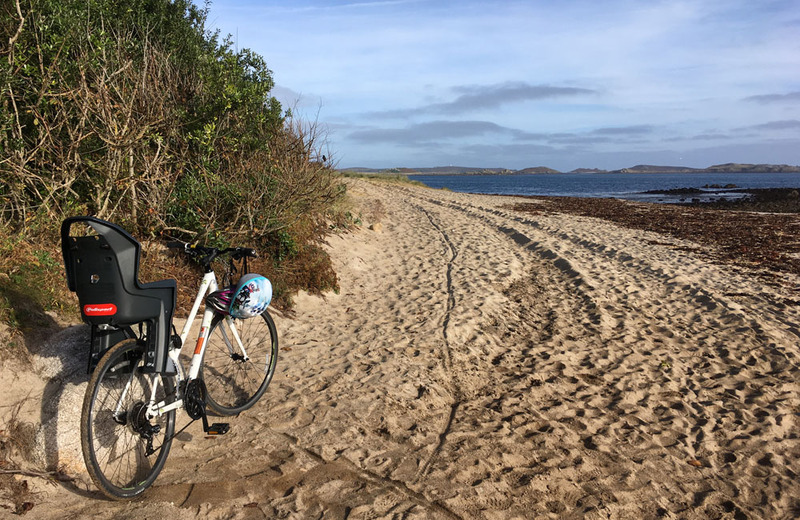 You can hire bikes (from £12.50 per day), with tandems and bucket seats for kids, at St Mary’s Bike Hire or rent a golf cart style, electric run-around from The Scilly Cart Co (£45 per day for a 2-seater). 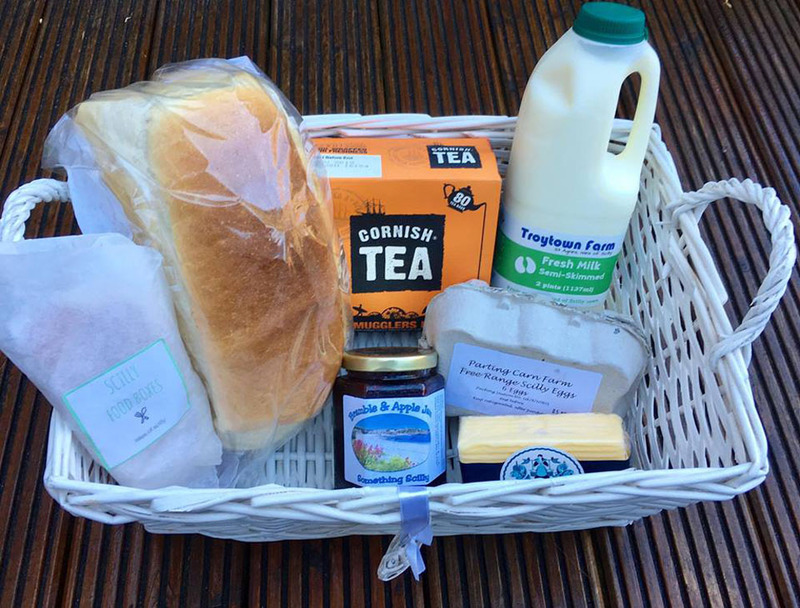 There’s a Co-op in Hugh Town on St Mary’s and various village shop-like options on other islands but I would recommend getting a box of supplies to get you started, from Scilly Food Boxes, which are filled with essentials grown and produced locally, as well as tea bags, milk etc. 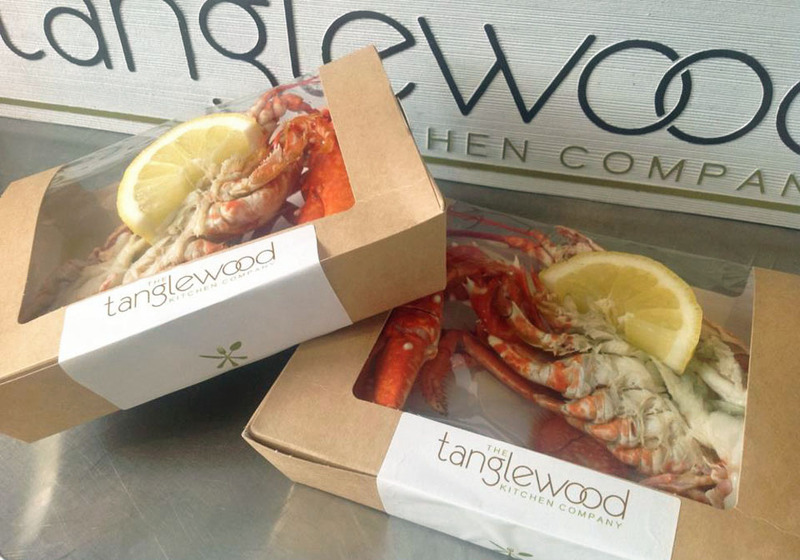 On evenings when you can’t be bothered to cook, I can highly recommend grabbing a slap-up meal to go from Tanglewood Kitchen in Hugh Town. 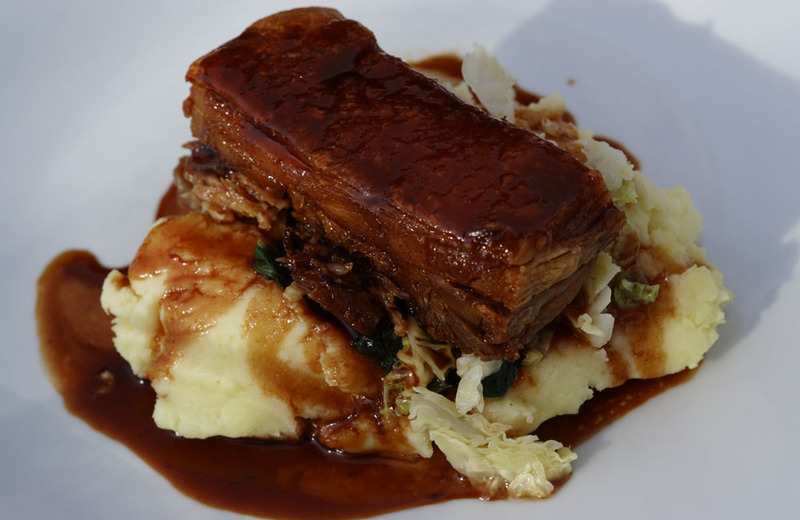 So much more than your standard ready meal, they are expertly prepared by owners Lindsay and Euan (former manager at London’s Savoy), with restaurant-worthy options, like slow and sticky lamb shank and Maryland crab cakes on the menu.